One of the highest rated 12 mil crawl space vapor barriers is the 12 mil DiamondBack™ crawl space vapor barrier. The DiamondBack™ brand can be found at CrawlSpaceRepair.com. Crawl Space Repair is well known for their high quality products and this 12 mil crawl space liner is no different. While vapor barriers can be found in 6 mil, 8 mil and 20 mil, the 12 mil is one of the most widely used sizes in the crawl space. We usually recommend the 12 mil crawl space vapor barrier for crawl spaces that have medium volume traffic and storage in the crawl space. Out of all the 12 mil barriers on the market, the 12 mil DiamondBack™ is among the highest reviewed and used. This crawl space liner is made in America and manufactured by CrawlSpace Concepts. This 12 mil has a basic string reinforced vapor barrier that is commonly compared to most other brands on the open market for the same pronounced thickness, 12 Mil. Actual 12 mil is equal to .012″, not 12mm. The DiamondBack™ 12 mil crawl space vapor barrier does not contain additives and is reinforced with a 1000 denier polyester cord to stablize the layers and prevent the vapor barrier from ripping. The appearance of this crawl space liner is bright white on the face and black on the back. Although it shares the color scheme of different brands on the market it is not the same. You will not find small pin holes in the this vapor barrier like you will in other white/black combination liners. 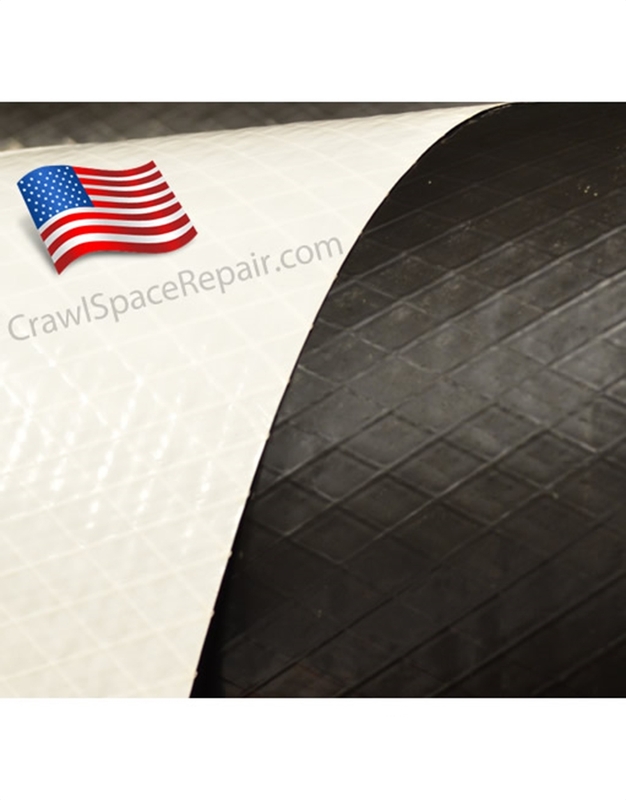 You will find this, like all of our crawl space liners, are made in the USA. This product is available in the roll size of 13’4″ x 75′. However, prior to shipping we fold the vapor barrier in half and roll it on an 82″ core. When should you use the 12 mil vapor barrier? Really, it depends on your crawl space. Most 12 mil liners are used on the crawl space walls. It’s a very common size for the walls of your crawl space. When it comes to the crawl space floor, it depends on what your floor looks like. If you have a hard, rocky crawl space, you may want to consider the 20 mil crawl space vapor barrier. Now, the Diamondback 12 mil is high grade and can stand the test of time. However, the 20 mil size can offer more protection. Another thing you have to consider is the foot traffic and storage on the vapor barrier. If there’s going to be a lot stored on top and a lot of foot traffic, you may want to upgrade to the 20 mil. If there’s light storage and traffic, than the 12 mil will do just fine. This 12 mil vapor barrier is used in encapsulating a crawl space. The DiamondBack™ 12 mil is 13’4″ wide by 75′ long (1000 sq ft). It ships folded to in half and rolled on a 82″ long tube. This 12 mil crawl space vapor barrier is used for crawl space floors that have medium storage and traffic, also used to encapsulate the walls of your crawl space. There’s a number of different crawl space vapor barrier sizes that can be used in the crawl space. Each size plays a different role and purpose in the crawl space encapsulation process.